As you can imagine there were a lot of influential films made in Hong Kong during the 80’s and 90’s. Few of them were funnier than what Stephen Chow was doing, and few of them were as visually striking and deeply emotional as what Wong Kar Wai was doing. As such Xu Zheng’s follow up to his buddy travel comedy, and surprise smash hit, “Lost in Thailand,” becomes a very intentional ode to the films made by these great Hong Kong filmmakers. In fact, it’s such a blatant ode to their films that it becomes a parody of them at times. Like “Lost in Thailand” this film keeps the schtick of having Chinese mainlanders becoming unwilling travel buddies while on vacation. They get each other into countless farcical jams that end up requiring them to work together, which only causes more problems. This time around Xu Zheng plays Xu Lai. He’s a man who suddenly finds himself in a midlife crisis. It stirs up regret that he gave up on his dream of becoming an artist. But more importantly it brings on memories of a lost love from the days of his youth. Now 20 years after his college romance with up and coming painter Yang Yi (Du Juan) failed to materialize, Xu finds himself happily married to another woman. Though she and her family constantly pressure him to conceive a child with her, often in obnoxious fashion. While on a family vacation in Hong Kong, he receives an invitation to attend the unveiling of Yang Yi’s latest painting. He decides to attend in secret for a chance to get away from his overbearing in-laws and a chance to meet up with Yang Yi one more time. However Xu’s kooky brother in law Cai Lala (Bao Bei'er), suspecting Xu of adulterous intentions, follows him around with a video camera claiming to be working on a documentary. Along the way Xu’s attempts to ditch Cai Lala and meetup with Yang Yi are met with numerous obstacles, many of which are either intentionally or unintentionally facilitated by Cai Lala. All of these obstacles keeping Xu from Yang are reminiscent of the random assortment of obstacles that kept him from her in the film’s opening flashback. And that flashback is by far the best thing this film has going for it. It subtly sets up the relationship between Xu and Yang, and manages to do so with minor amounts of slapstick comedy. After introducing the characters in a classroom setting, it turns into a silent film set to music. It’s a Pixar-esque montage that recalls the opening of “Up” though with more comedy and less emotional resonance. Nevertheless it’s a strong, artful opening to a film whose artistic aspirations end shortly after the montage comes to a close. It shows a young couple falling for each other, but struggling to make time for intimacy due to life’s continuous obstacles. Fittingly one of the films they watch together -and he not so subtly picks up a DVD copy of- is “Comrades: Almost a Love Story,” a 90’s romance about two Chinese mainlanders living in Hong Kong and falling in love while dealing with obstacles. Quickly enough the montage turns to photos and quicker cuts to establish the passage of time till the once young Xu, now split up from Yang, is seen in photos with his wife and family. Xu and Yang may have been attracted to each other, they may have had similar interests in movies and art, but fate got in the way of every intimate act they attempted. Xu’s ensuing journey to meet up with her again, now years later, similarly finds fate standing in the way. Yet as quickly as the film moved into artful exposition through montage it rushes into an MTV style fast cutting credit sequence of beauty shots around Hong Kong. It’s a strange tonal shift, and sadly it’s far from the last problematic tonal shift in the film. Xu Zheng also borrows a few musical choices from Wong Kar Wai’s filmography. He uses Xavier Cugat’s renditions of “Perfidia” and “Siboney” both of which were used several times throughout Wong Kar Wai’s filmography. In “Days of Being Wild” (another one of the films Xu and Yang are seen watching in the opening montage) Xavier Cugat’s music was used several times but notably when a character fancies himself up for a night on the town. Here it’s used for similar effect, but cut short for comedic purposes when Cai Lala pops into the scene. From the intro that alludes to Peter Chan’s “Comrades: Almost A Love Story” to the referential musical cues, “Lost in Hong Kong” quickly becomes an amalgamation of classic Hong Kong film references. While initially these elements feel like oddly specific, parody they eventually start feeling more like references simply for the sake of making references, as they start to contribute less and less to the comedy. There’s a reference to the expiration dates found on canned pineapple in Wong Kar Wai’s “Chungking Express,” as well as one for the room number 2046 that appears in both “In The Mood for Love” and the follow up “2046.” Xu even tells his awkward brother in law that if he shuts up for a while they might even become “one minute friends,” a line pulled straight from “Days of Being Wild.” Yet these are so blatant and out of the blue they come across as lazy rather than the reverent references they were likely meant to be. That sounds exactly like the sort of film Xu Zheng set out to make here. 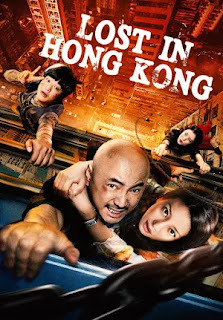 However, because “Lost in Hong Kong” tries to make so many references and partake in so many different genres, it never decides what it wants to be. It fails to put aside the references long enough to establish its characters or give them anything interesting to do. It completely fails to be the buddy film its predecessor was. Xu and Cai Lala, aren’t as fun to watch on screen or as well fleshed out as their counterparts were in “Lost In Thailand.” I’d blame the performance by Bao Bei'er for not making a compelling or likable character, but the material is just as much at fault. The last 40 minutes of this film requires Xu’s wife, played by Zhao Wei, to play a fairly significant role despite giving her very little screen time or character development up to that point. Worse yet the last 40 minutes also kicks a needless murder mystery subplot into high gear, while we’re still wondering why it’s in the film at all. Xu Zheng’s dedication to the inspirational filmmakers who came before him is admirable. Yet there’s a good chance “Lost in Hong Kong” will lose anyone unfamiliar with the references it’s making. Without the nostalgia of the references, this is a poorly conceived mess of a film. The closing credits song in “Lost in Hong Kong” is sung by famous Hong Kong singer and actress Faye Wong. Her acting career began with Wong Kar Wai’s “Chungking Express,” which also features her music playing over the credits. I made mention of the many Hong Kong films referenced within this film, but there’s also a scene that plays like one from a certain other classic Hollywood film. While wandering on set of Wong Jing’s latest film production Xu and Cai Lala inadvertently find themselves cast as extras in the film. It recalls the Jerry Lewis comedy “The Errand Boy” in which Lewis inadvertently ruins countless film productions by wandering on set during filming.